Listen to this recording of the show with Todd Gross – where we describe to you what all the fuss is about! Non-Disclosure Agreements have been lifted on this project! We can now divulge all of the info! 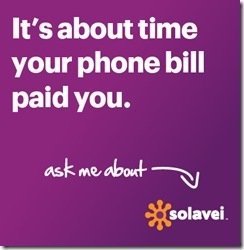 Solavei is a new Social Commerce company that is launching nationwide this September and will bring to the market a vision of making life better for millions of people. The technology and services being created have never been introduced before, but the plan is simple: build a company that utilizes the most effective advertising method of all – its customers. They, in turn, will be rewarded for spreading the word. If you want to save money on your voice/text/data plan and get paid for telling others about it… you can’t actually get started until August 22, but if you want to get a head start telling others about this and lock in YOUR position! Fill out this form and we will send you your invitation! Yes, Micheal & Yvonne, I want to find out more about the company that you have been talking about on Blogging With Micheal.